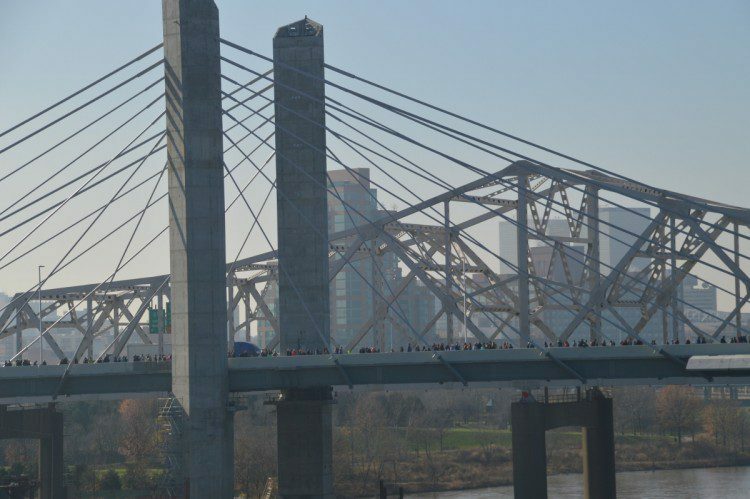 Dec. 16, 2015 – Traffic on I-65 South is now crossing the Abraham Lincoln Bridge. I-65 South traffic moved to the Lincoln Bridge early this morning. The Lincoln Bridge, the centerpiece of the Downtown Crossing portion of the Ohio River Bridges Project, opened to northbound traffic on Sunday, Dec. 6. The Lincoln Bridge is carrying three lanes of northbound traffic and two lanes of southbound traffic as extensive improvements are made to the adjacent Kennedy Bridge. As southbound traffic shifted to the Lincoln Bridge, another long-term ramp closure began. The ramp from I-65 South to I-64 West has closed. It’s expected to reopen to traffic in late summer 2016. Signed detours are in place. Drivers are likely to use I-265, I-264 and surface streets to reach I-64. During the closure, the current ramp will be demolished and a new ramp will be built. The I-65 South traffic shift means drivers will notice additional changes on the Kentucky side of the river. Drivers exiting from I-65 South to Jefferson Street have an earlier decision point. The new access point to Jefferson Street is just south of Witherspoon Street. There’s also a new, temporary alignment for drivers traveling from I-65 South to I-64 East/I-71 North. They have a later decision point, just east of Witherspoon Street. I-71 North traffic splits to the left. Drivers need to slow down, avoid distractions and pay close attention to signage as they adjust to the traffic changes. Now that I-65 South traffic has shifted to the Abraham Lincoln Bridge, all but one lane on the adjacent John F. Kennedy Bridge is closed. The single lane maintains access from I-65 South to I-64 East and I-71 North. The lane to maintain eastbound and northbound traffic is expected to remain open for just over a month. The Kennedy Bridge is expected to close completely in early 2016 and remain closed for just over six months. One lane on the Kennedy Bridge is expected to reopen late summer 2016 to restore access to I-64 West, I-64 East and I-71 North. During the closure, a new floor system is being installed on the Kennedy Bridge. The $22 million in improvements are expected to add decades of new life to the 52-year old bridge.